Sometimes we need a little help to look our best. Three sources of Vitamin C are specially blended to reduce the appearance of aging Living, like fine lines and dark circles. The nutrients and natural texture of Noche Y Dia Vitamin C Serum ingredients act as a breath of freshness for the skin. Order now to be delighted, or keep reading to learn more. Skin feels refreshed and vibrant after each use because the soft silky finish of Noche Y Dia Vitamin C Serum never feels greasy and has a velvety finish. Each bottle comes with a 100% satisfaction guarantee to give confidence to every Noche Y Dia purchase. Three Vitamin C sources are key ingredients to the potent Noche Y Dia Vitamin C Serum. Lemon Oil acts as a complexion lightener* to reduce the appearance of dark spots and fine lines while detoxing skin. Kiwi Seed Oil is loaded with nutrients that rejuvenate and moisturize tired skin to help slow down signs of aging living, like fine lines and dark circles. One reason Vitamin C Skincare is so popular and potent is the antioxidant properties Vitamin C has, which aid in collagen synthesis, reducing the appearance of aging and wrinkling. Vitamin C is found in two layers of skin (dermis and the epidermis). But as we live life, the Vitamin C content once found in the skin diminishes. * If this vital piece of youthful skin is not replenished, wrinkles and other signs of aging can appear quickly. Here are just a few ways Vitamin C benefits skin. Vitamin C may protect skin from damage by harmful UV rays! Not in the same way sunscreen or SPF does. Instead, Vitamin C can prevent UV induced damage from free radical cells. That means Vitamin C can help in preventing UV related DNA damage, apoptosis, and lipid peroxidation. The antioxidant process allows more collagen and elastin to be produced. Collagen and elastin are essential skin proteins that are responsible for keeping skin firm and supple. They also make up most of the dermis and the epidermis. Therefore, the more the Vitamin C skin has access to, the firmer skin will remain! The Noche Y Dia Difference is Like Night and Day. Vitamin C Serums are not created equally. Poorly sourced ingredients, fillers, packaging, and water can all destroy the benefits of a Vitamin C Serum. The worst part about most beauty products is that feeling 1-2 months in, when a new favorite product just fails to last! Opening a product and feeling a gritty shift in texture, or noticing an interesting scent after it's already been applied to the whole face... the worst! 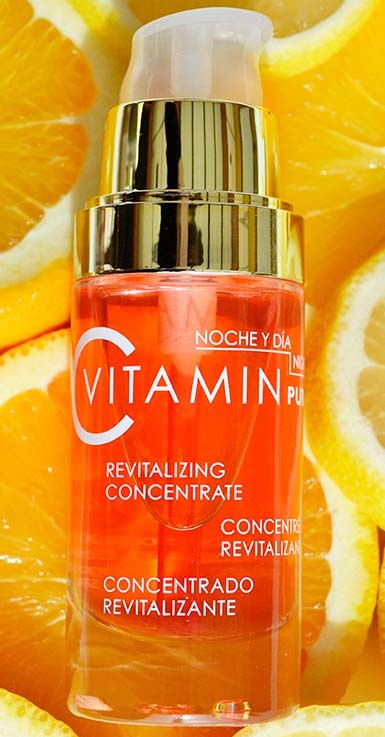 Noche Y Dia Vitamin C Serum takes advantage of years of beauty formula research to make sure each drop of Serum Lasts Until It's Gone. Vitamin C can actually deteriorate and break down in certain formulas. That's why Noche Y Dia Vitamin C Serum comes in a glass bottle, with no water listed in the ingredients. There is no other skincare company with a guarantee like Noche Y Dia. We pride ourselves on the happiness of each Noche Y Dia customer and family member. The Noche Y Dia Customer Care Team is always ready to make sure each purchase is fulfilled with quality and care, and every question is answered. Research, customer testimonials, and ingredient sourcing led us to deliver the enhanced Vitamin C experience from Noche Y Dia. Noche Y Dia Vitamin C Cream and Vitamin C Cleansing Water are now available to extend the benefits and enjoyment of Noche Y Dia Vitamin C Serum! To create our new favorite Vitamin C additions, we decided on two moments we all go through during the day. Sometimes you just want to indulge with a silky cream. Why should a quick face refresh involve harsh soaps and dunking into a sink? Wet bangs + dried out skin = the worst. Noche Y Dia's Vitamin C Rejuvenating Cleansing Water is a unique first step in your beauty routine. This Vitamin C based rejuvenating cleansing water completely sweeps away stubborn makeup, dirt and debris from your face and eyes without the harshness of typical facial cleansers, leaving your face refreshed and silk to the touch. All the benefits of Noche Y Dia Vitamin C Serum, in a creamy-silky-smooth base! * Lightweight and naturally scented, this cream feels like butter when you dip your fingers into the luxurious glass jar. After gliding across your skin, this cream will leave a fine layer of moisture before quickly soaking in for a velvety finish. Use on your face, hands, and neck for an indulgent Vitamin C experience.